Sterling Publishing (NY), 9781402778933, 303pp. 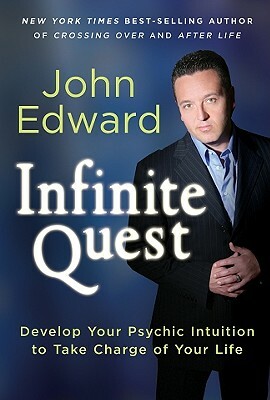 Best-selling author John Edward has captivated audiences worldwide with his unique and powerful psychic skills. Now, in his long-awaited new book, he shows people how they too can tap into their psychic selves. "Infinite Quest" will help readers to develop their intuition and renew their own latent powers, so they can confidently take chances and make choices. By following certain guidelines and intuition-building exercises, we can learn to get in touch with our Spirit Guides and identify the psychic energy around us on deeper levels. Edward also discusses how technology can work with our sixth sense, and explains how to use divination tools. Like his new eponymous website, "Infinite Quest" is truly a portal to all things metaphysical.